Mark has been entertaining children since 1987. Over this time, he has built up a great reputation for professionalism and reliability. Having the natural ability for making children laugh, his shows are designed to provide a feast of fun, each and every time. Mark's unique style makes him a firm favourite with children and family audiences. Mark uses wacky magic wands and funny magic words in his comedy Magic Show which is just bursting with lots of fun, involvement and laughter. Enjoy the look on the children's faces as Harvey, Mark's real live fluffy white rabbit, appears for thin air. Mark is also one of the country's leading experts on Punch & Judy and his show is so highly rated that he has the honour of being amongst just a handful of performers to be presented with an award by fellow performers who all recognise his show as being amongst the very best in the UK. 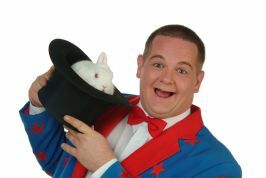 He regularly perfomrs his hilarious shows throughout the country in Town Centres, shopping Malls and at Public Events and Promotions ..in fact where ever there are children who need to be entertained. Mark list of pervious clients include: Birmingham Airport, British Gas, BUPA, Hewlett Packard, Marconi, Rolls Royce, Unipart, Warwickshire Fire Service, West Midlands Police and lots more..